This very elegant but dramatic necklace consists of two lengths of bronze tone thick chain of different lengths each ending in a round ridged bronze tone metal ball. 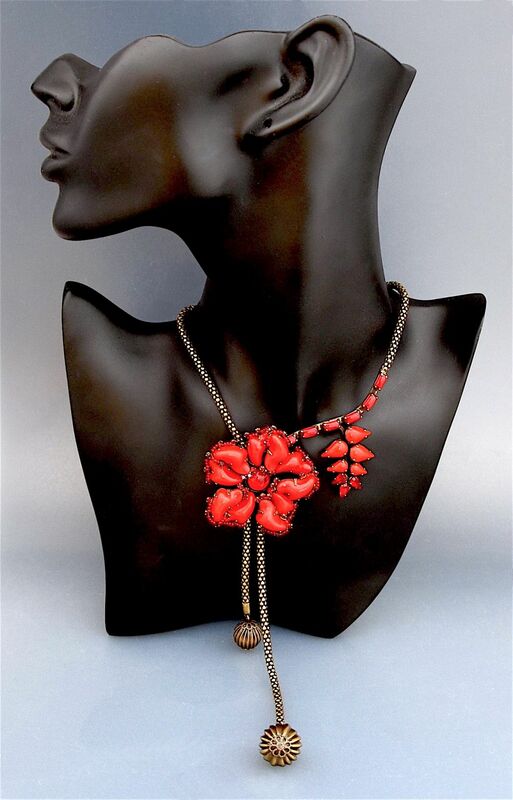 One side of the chain is set with 5 rectangular cabochon red paste stones with a leaf sprouting off to the side, the leaf set with 5 pear shaped scarlet cabochon glass stones and three deep red pear shaped faceted paste stones. At the bottom of the row of stones and set above the junction of the two chains is a flower that consists of 10 abstract shaped cabochon scarlet glass stones set at different levels and edged with small red glass beads with a round deep red cabochon glass stone in the centre. The adjustable fastener has an oval tag script signed "DeLuxe".